But maybe I need to change my view. I can trace it back to the 3rd grade. It was the Friday before winter break (back then we were allowed to call it Christmas break) and the natives were restless. To try to contain our exuberance for the extended break – the entire school was ushered into the gym and we were allowed to watch a movie, as opposed to the teachers struggling in vain to actually hold our attention long enough to teach. We all got in our seats, sitting shoulder to shoulder with one another, the lights were dimmed and the movie started. The movie was Old Yeller. I cried at the end, when Travis had to shoot Yeller. Even at that age, I couldn’t imagine anything more horrific. Unfortunately, as soon as the movie was over, the lights were quickly turned back on and I was busted by one of my friends. That began a lifelong obsession with happy endings. I don’t like any book, movie or TV show that has a sad ending. I have a long list of movies that I refuse to watch because I know it ends badly for the main characters. Exactly what the sad ending is doesn’t matter. It could be death, divorce, the loss of a friend or unresolved conflict. 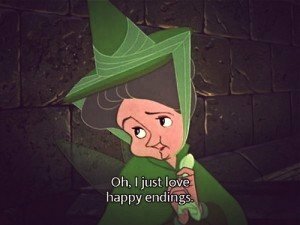 I’ve often wondered if part of the reason I love Disney and their movies so much is because you know you’re going to get a happy ending. After all, a dream is a wish your heart makes. The Prince always gets the Princess, the mean stepmother always gets her due and the puppies always grow up happy. But I find myself wondering if that vigilance in protecting myself from all things sad/bad has taken an unexpected toll. I wonder if I’m capable of accepting an unhappy ending and perhaps the more important questions — what am I willing to do/endure to avoid it and what’s the cost of that choice? Intellectually I know that life is not a Disney movie and sometimes people and pets die, relationships end and people get hurt. I can accept all of that on a macro level, when I’m watching the news or reading about violence far from home. But when I look at my own life and my own choices I have to ask – what are the consequences for me, and those that I love, when I refuse to accept or acknowledge the sad ending? Are they actually worse that just letting something end how it should? I have to admit, I’ve become a master at it. I’m always good. Things are good. The family is good. Work is good. Life is good. Even when it’s not. Am I afraid I’ll be caught crying? Am I afraid I am not strong enough to get through it? Or not strong enough to help others survive it? Is it a reluctance of admitting a mistake or defeat? It is about how others will view me or how I’ll view myself? At 51 I suspect there are many endings waiting around the bend for me. There are some that should have already come that I have deftly avoided. There are others I will not be able to control or ignore. What if bravely walking through the sad ending is actually easier than what I’ve been doing all my life? What if by avoiding it for years I’ve actually weakened my ability to endure the ones that are coming? What if Old Yeller and Marley and Me and the deaths, divorces and other losses were actually on my path for a reason? And perhaps the most haunting question of all for me – what have I been teaching my daughter about facing hard truths, owning what’s mine and finding the courage to work my way past the bad into a better, different light? I don’t know the answer to any of these questions. I just know I need to start asking them.